Here’s my list of gaming gems. Back in 2006 Nintendo developed the game Electroplankton as one of the first musical based titles for it’s Nintendo DS platform. Originally released in Japan and then later in the States, Electroplankton isn’t so much a game as it is an instrument of sorts. The user can create masterpieces using the beautiful effects of ten different plankton characters. Each character comes with a beautiful interactive backdrop allowing you to use the touchscreen and microphone to create a world of music all your own. While one of the main complaints of the title is that it doesn’t have a save feature so that you can save your works of art, this was done intentionally to force the user to keep creating new and interesting works each time it was turned on. To this day there is nothing on the market quite like Electroplankton and whether you’re an amateur, or a seasoned musical artist, creating beautiful music in stunning motion is some of the best fun to be had. The year 2002 saw a game called Cubivore also developed by Nintendo. Originating in Japan, Nintendo thought that the game might be too obscure for American audiences leaving the publishing rights to Atlus in the states. The game was originally intended to release on the Nintendo 64 although GameCube became its final destination. Due to this fact, graphically speaking it is a bit lacking although the ironic part is that the style is very comparable to Minecraft. The premise is that you have a cubed being that starts out as basically a block. By consuming the creatures around you in an RPG type setting, you can grow limbs, a tongue, legs and basically become a stronger being to conquer your world. Depending on the color or type of creatures you eat different aspects of change become more prevalent on your own character. If just eating everyone around you isn’t fancy enough for you, then maybe the fact that you have to mate at the end of each level will change your mind. Your cuddly friend seems to want to get it on quite often as he’ll state that he’s thinking about “getting chummy” creating offspring to move on to the next stage. You’re current character will die before the next stage starts, leaving a body cold and motionless for the babies to move away from into their own evolutionary phase. Oh and everything screams and bleeds when you kill it, there’s a lot of pooping, and there’s a large focus on getting your hump points higher. Great job Nintendo on being the only company that could make a game this creepy and still keep and E rating. 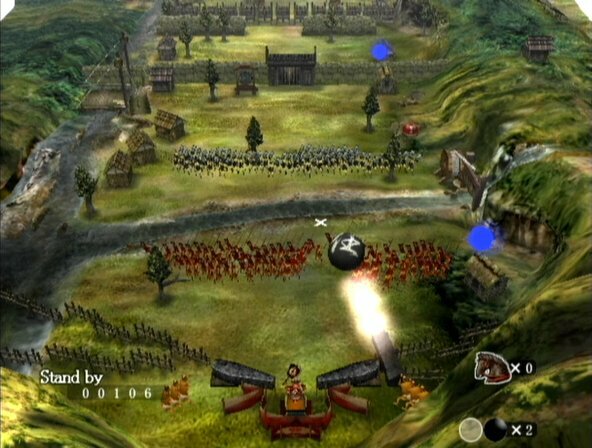 Odama released in 2006 for the GameCube, by the same creator as Seaman for Dreamcast, is a rarity, using the microphone to control a small army while using the GameCube’s pad to control an environment stuck in a pinball machine. The Odama itself is a mid-evil weapon carved from stone and hoisted on ropes. It acts as the pinball in the game world. This is truly a game that was before it’s time and something that might work on the Wii U or DS well. The pinball world could be tilted and commanding your army was no small task. There are eleven commands for the troops, all of which must be spoken into the microphone that came packaged with the game. This isn’t a game for beginners seeing as how there is such a learning curve to use the microphone and controller at the same time, however, I feel it is well worth the effort and personally my most favorite buried treasure to date. Released in 2010 this PC game slipped under most peoples radar which I find rather surprising considering that Horror game fans are always complaining they need the genre to step it up and Amnesia is definitely the answer to that call. The player sees the game from a first person view and makes their way through some of the most intense moments of fear I’ve ever experienced in gaming. Danial, the main character, wanders through a dark castle dungeon and as the game suggests, has amnesia and can’t remember any of his past. As Danial’s story unfolds he regains his memory and finds clues as to why he was in the castle in the first place. Seeing as how Danial is alone in a castle full of death, destruction, and demon cries without a weapon, it makes the player feel a bit more desperate than usual. Your only recourse to monsters you encounter in the game is hiding. That’s right, like you would do in real life, no ninja moves here. Danial also has an insanity level that creeps up the more he watches his enemies and the more he spends time in any sort of darkness. This game is a delicate balance between losing your mind, and life, but it’s incredible.